Supple Magazine » The Movie ‘STILL STANDING’ Set To Hit Cinemas FEBRUARY 2015! The Movie ‘STILL STANDING’ Set To Hit Cinemas FEBRUARY 2015! Genmemoir Productions gets set to release ‘Still Standing’ in cinemas in Nigeria nationwide. The film is an emotional drama starring Jackie Appiah, Bobby Obodo, etc and was shot entirely in the United States of America. ‘Still Standing’ is a story about the joys and pains of a striving young American family, originally from Africa, living the American dream until a major tragedy alters the family’s course. Nne-Amaka (Jackie Appiah), will try to be the lifeguard for the family in the middle of this stormy sea. Can she weather the storm? Will there be a strand of hope in this family tsunami? Featuring as her husband in the movie is heartthrob/fan favourite Bobby Obodo, whose convincing acting on set, sparked rumours that he and Jackie Appiah were an item! Hmm… Are they or were they? Well, there’s only one way to find out and that’s by watching the movie, ’Still Standing’ when it premieres and screens in cinemas nationwide as from 27th of February 2015. The movie also stars Jazmine Batchan, James Alexander III, Buddy Miller Jnr and was directed and produced by Michael Uadiale. Ben Adeyanju http://www.ibenjamen.com was Assistant Director, Tom Robson was Technical director, DOP/Cinematography was by Franklin Guerrero. 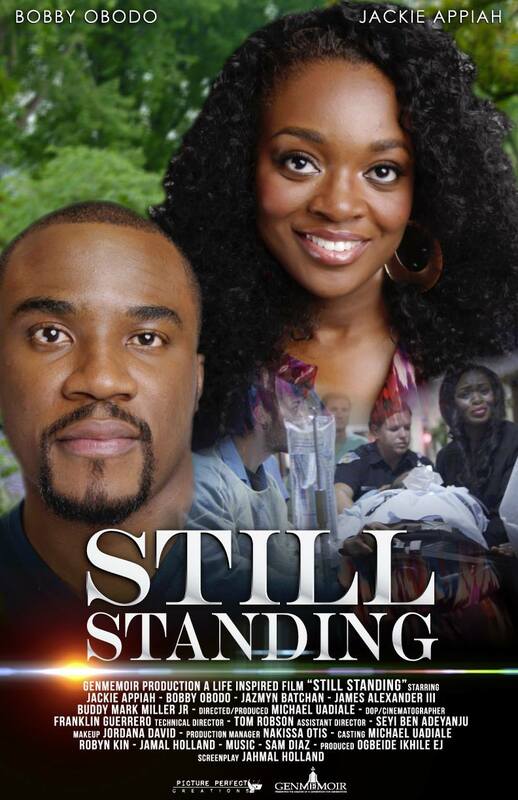 ‘Still Standing’ won the GIAMA Award Best Film (in Diaspora) in 2013, it was nominated for Best Director category(GIAMA Awards) Nominated at the 2014 Africa Magic Viewers Choice Awards (AMVCAs) for Best Supporting Actress and Best Writer categories. The movie will be showing in cinemas nationwide in from the 27th of February 2015 so make sure you go see it!